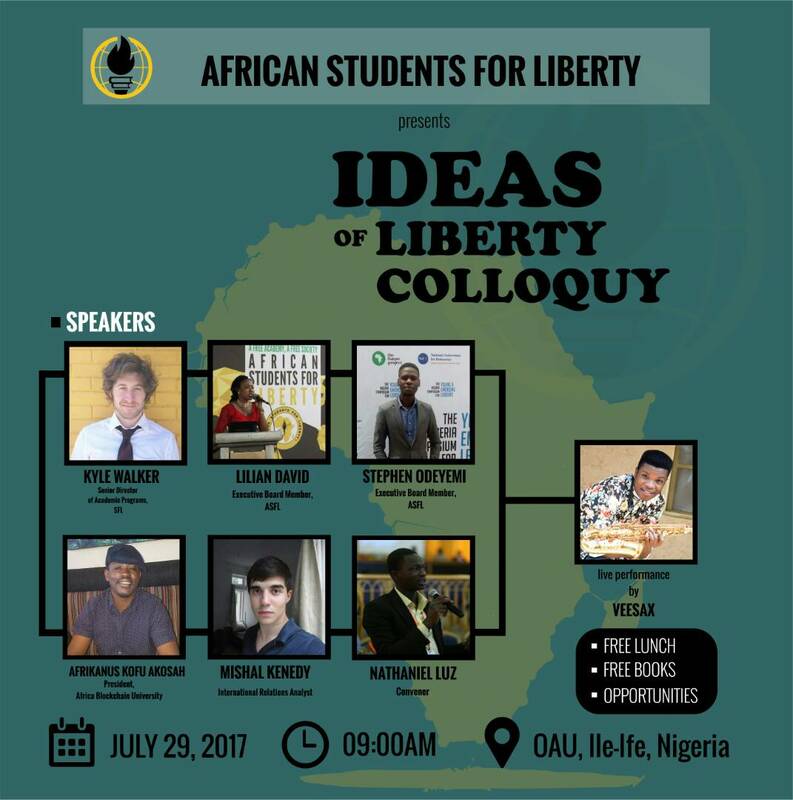 African Students For Liberty presents Ideas of liberty colloquy. The colloquy is an intellectually-engaging student conference will bring together campus leaders and advocates of free society to discuss, and share practical ideas on how to promote the ideas of tolerance, liberty and markets. The ASFL – Nigeria Executive Board Secretary, Nathaniel Luz said that in furtherance of their mission, they organize events and platforms in tertiary institutions to foster discussions and a deeper understanding of economic freedom, development and overall human wellbeing. Nathaniel said that the conference will be in tune with the theme #IdeasOfLiberty with speakers sharing on the various ideas of liberty and how they can be applied in everyday life circumstances. The speakers will be speaking on range of practical, interesting and diverse topics ranging from Entrepreneurship, Cryptocurrency, Property Rights, Digital Rights and Internet Freedom, Liberty in Africa, Free speech, and would have an engaging interaction with the participants. Speakers at the event include: Kyle Walker, Senior Director of Academic Programs at Students For Liberty; Afrikanus Kofi Akosah, President, Africa Blockchain University; Stephen Oyedemi, Executive Board Member, ASFL; Lilian David, Executive Board Member, ASFL; Mishal Kennedy, International Relations Analyst; and Nathaniel Luz, Secretary, ASFL – Nigeria Executive Board. The conference will take place 9:00am Saturday, July 29, 2017 at the Conference Hall of the Students’ Union, Obafemi Awolowo University, Ile–Ife, Nigeria with a free lunch pack and souvenirs for every participant at the event.